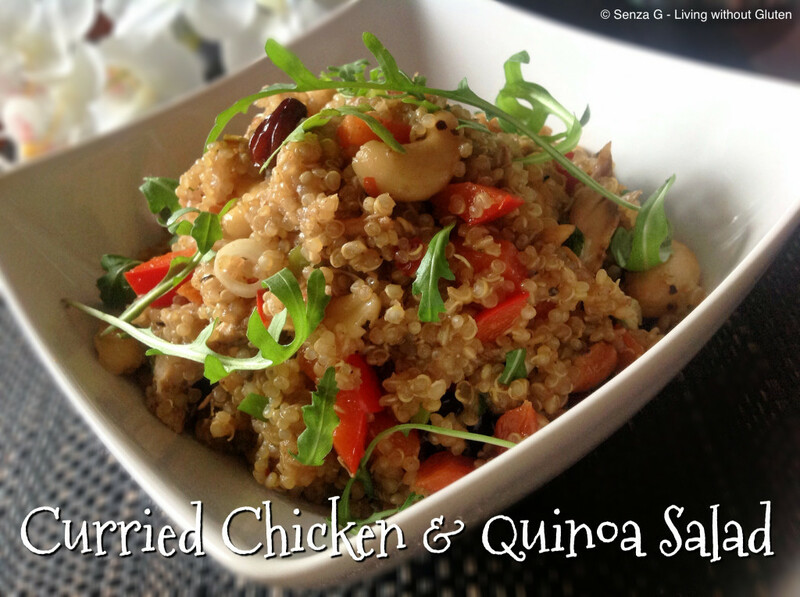 Quinoa is becoming relatively popular nowadays and is used in many dishes, both sweet and savory and also in flour form. It is the perfect gluten free source of protein, iron and fiber. This nutty tasting grain looks like couscous and is very versatile like rice, perfect for salads, in fact I have here used it in a chicken salad. In a medium pot, place the quinoa, the water, GF stock powder and salt. Bring to a boil, then cover and simmer over very low heat until all the liquid is absorbed and the quinoa is tender. This should take about 12 to 15 minutes. Meanwhile in a large pan, dry roast the cashew nuts in a pan and set aside. Heat a tablespoon of the coconut oil and add the raisins, the ginger and one teaspoon of the curry powder. Cook until fragrant, remove and set aside. In the same pan, heat the other tablespoon of the coconut oil, add the chicken pieces and the other teaspoon of curry powder and the soy sauce. Keep stirring until chicken is completely heated through. Reduce the heat and then add the quinoa and the raisins mixture. Stir well and cook for a few more minutes for the flavors to combine. Adjust the seasoning if necessary, adding more salt and pepper or soy sauce. Remove from the heat, add the sliced peppers, the chopped spring onion and the rocket leaves, mix them in and sprinkle the top with the dry roasted cashews. * You can also use fresh chicken which you can slice and sautee in the pan before adding the curry and soy sauce.